In skills workshop this week we discussed some of the hard topics covered in Sherman Alexi’s book, The Absolutely True Diary of a Part-Time Indian, and what to do when you like a book by an author who has done some pretty bad things in their past. We’ve continued studying heat and temperature in science and reading The Mayflower by Nathaniel Philbrick in humanities class. Zach “the History Man” visited Four winds on Tuesday and had a great time. He began the first of three trial days this Friday and we’re really enjoying having him here! 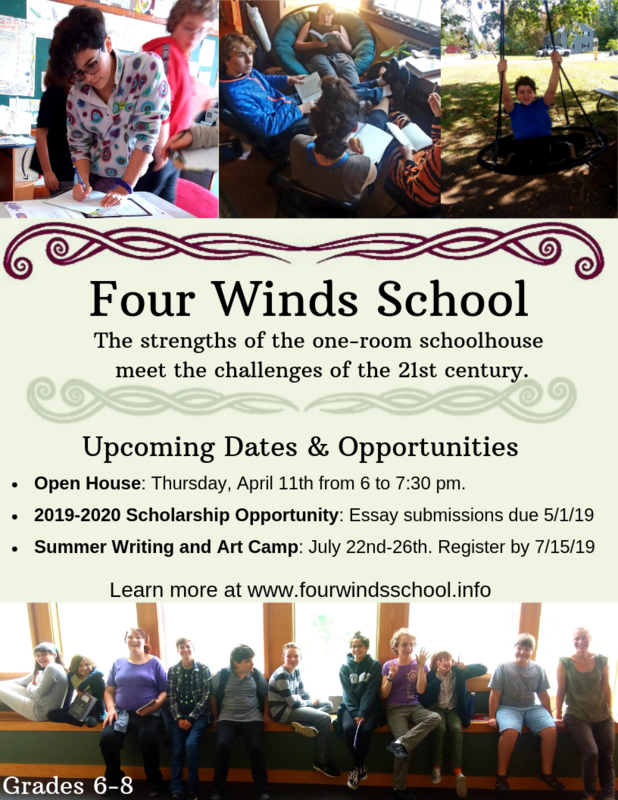 Open Houses are a great way for prospective families to see the building, learn about our unique program, and meet the teachers, other families, and students. It’s also a great way for current students to socialize with each other outside of school hours, and for alumni students to reconnect with old friends and former teachers! We provide pizza from Turners Falls Pizza House. Current families are encouraged to bring other dinner foods, snacks, drinks, or desserts. We hope to see you all there!